If you’ve been following along for awhile you probably already know how much I love the effect of crocheting with wire … you can find my past wire crochet patterns and tutorials here. 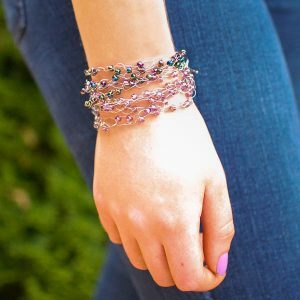 I wanted a wrap style bracelet that could be layered or worn alone for a boho-chic style and I am in love with the result of this beaded crochet bracelet design! *When working with wire it can be difficult to maintain an accurate gauge so I will give you mine as a reference, but your best bet is to try it on as you go. Gauge: approx. 14 ch in 4 in. Pattern is written for a bracelet that wraps 3 times (with changes for a 5 wrap version in parentheses. Step 1: Thread approximately 70 (130) beads on your wire (you may not use all the beads but it is better to add more than you need on than to realize you didn’t have enough at the end). Step 2: Start with a slip knot of the wire on your hook, leaving about a 4-in. tail. Move first bead up to rest next to your hook, then yarn over with the wire and pull through (first chain stitch made), repeat this with the next bead until you have chained 60 (115) or until the bracelet comfortably wraps around your wrist 3 (5) times (remembering to allow an inch for the clasp). Fasten off and cut wire leaving about a 4-in. tail. 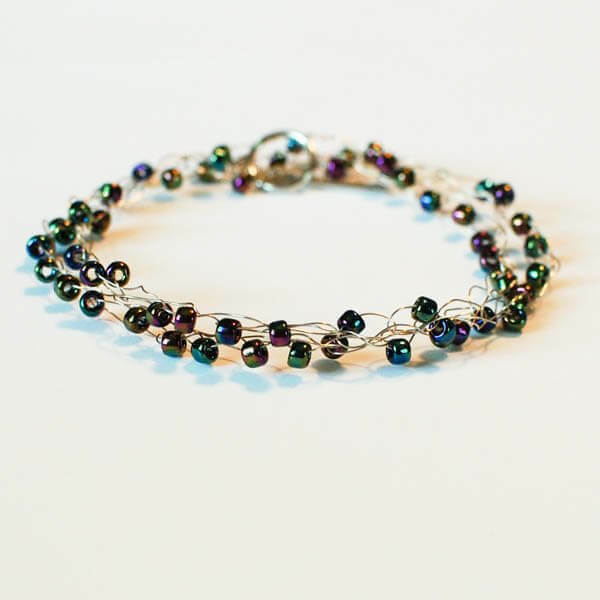 Step 3: Starting at either end of your bracelet, thread a crimp bead onto your wire and then one side of your clasp. Thread the wire back down and through the crimp bead again (as shown below). 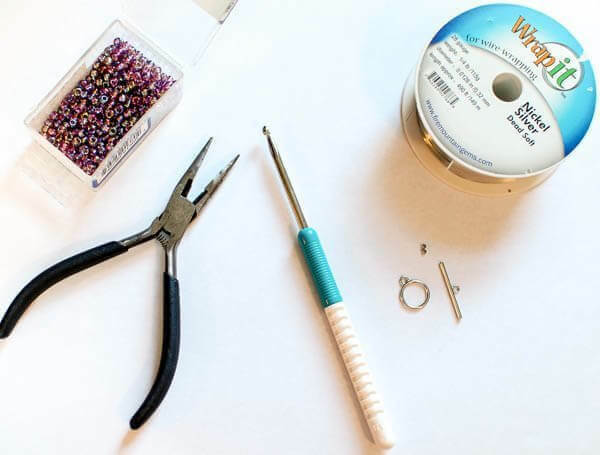 Pull the wire through so the clasp fits nicely at the end of your bracelet and use your pliers to flatten the crimp bead. Weave wire through a few chains to secure it and then try to fold the ends into themselves to keep them from poking you. Repeat on the other side. I wrap the wire around and around like when I do the head pins. Then put a dab of glue to seal it from poking me. Thank you so much, Kara! My mom passed last week and I have been racking my brain as to what to do for the staff as something special from me to them that wouldn’t be time consuming. Blessings!